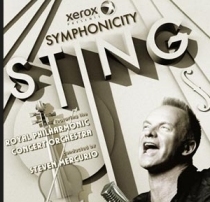 We are pleased to announce that Sting, accompanied by the Royal Philharmonic Concert Orchestra as conducted by Maestro Steven Mercurio, has expanded this autumn's European Symphonicity tour with new dates in Tallinn, Vilnius, Prague, Geneva, Zurich, Manchester, and Edinburgh. Please consult the list below for details of presales and public sales for these shows. All fan club presales start at 10am (local) unless indicated otherwise. Legacy Fan Club members will have a one hour advance window when Fan Club sales begin, after which the sales will open up to all members. All presales at 10am (Local) for Legacy members/one hour later for other members. It's purely a coincidence, Sting insisted with a chortle, that he and Peter Gabriel each decided to tour and record this year with full orchestras - two Rock and Roll Hall of Fame inductees doing highbrow symphonic-pop projects at nearly the same time. "Peter Gabriel and I are not tapping each other's phones!" Sting said, his laughter reaching a well-modulated crescendo. "We've both grown in the same kind of creative arc. We're both led by curiosity. And this is the adventure we decided on..."